One of our favorite Christmas movies is White Christmas, despite the fact that it has a zillion plot holes and much of the music doesn't actually revolve around Christmas. After the success of 1942's Holiday Inn, which first featured the song "White Christmas", White Christmas was a loose follow-up on the concept, adding color, more Christmas theme, and Danny Kaye instead of Fred Astaire. Today's song, The Best Things Happen While You're Dancing, is sung at the beginning of the film during a dancing duet with Kaye and Vera-Ellen. Curiously, there was never an official soundtrack release for White Christmas that contained all the original songs/performers. Because movie leads Bing Crosby and Rosemary Clooney were signed to rival record labels, they could not record together on a soundtrack. Thus, two albums were released. Clooney released Irving Berlin's White Christmas (1954), with her performing songs from the film. 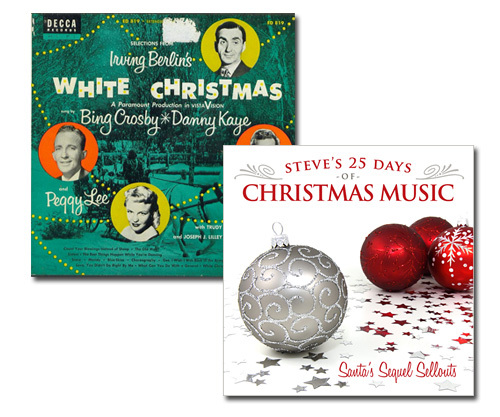 Bing Crosby and Danny Kaye were featured on Selections from Irving Berlin's White Christmas (1954), with Peggy Lee replacing Clooney's voice on the appropriate tracks. Today's song is from this album, which runs at a slower tempo than the version performed in the actual film.